President Donald Trump signed a new directive Tuesday aimed at formally establishing a space-focused military branch that will begin as an extension of the U.S. Air Force, another step toward making a Space Force a reality. "Today I'm thrilled to sign a new order taking the next step to create the United States Space Force, so important, when you look at defense," Trump said before signing the order in an Oval Office ceremony Tuesday, warning that the U.S. must be prepared to confront its adversaries in space. "My administration has recognized space as a war-fighting domain and made the creation of the Space Force a national security priority." Congress will have the final say on whether a Space Force is established. Trump, on the campaign trail and elsewhere, originally touted that a Space Force would work as its own branch on par with the Air Force, Army and Navy, promising "American dominance in space." But the "Space Policy Directive 4" has been scaled back from that and puts it more in line with the status of the Marine Corps under the Navy -- a route seen as more palatable to skeptics in Congress. 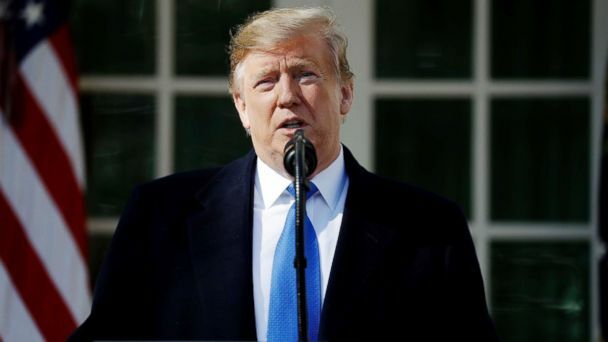 "We haven't abandoned that goal, and I think we're achieving what is the president's number one objective which is a separate armed service," a senior administration official told reporters on a conference call outlining the legislative proposal Tuesday. It's a "step toward a future military department for space," the official added. As ABC News has previously reported, the official confirmed to reporters that the Space Force will be headed up by a four-star general who will serve as chief of staff and will join the ranks of the Joint Chiefs of Staff. The president also would nominate a civilian undersecretary, beneath the Air Force, to be approved by Congress. Late last year, Trump signed a memorandum establishing the Space Command, the military's 11th unified combatant command -- which centralizes the Department of Defense's warfighting operations in space. In contrast, the Space Force will likely focus on the recruiting, training and equipping of service members for the space mission, along with acquisition. Tuesday's directive tasks the Secretary of Defense with drawing up the official budget request for the president's fiscal year 2020 budget, and the official said that they expect the start-up cost won't exceed $100 million. Last year then-Deputy Secretary of Defense Pat Shanahan, who now serves as the acting Defense Secretary, put the total cost at less than $5 billion. An official said Tuesday that the figures are still tracking to the "low billions." "Space Policy Directive 4" will also ask the defense secretary and director of national intelligence to compile a joint report for the president within the next 180 days that outlines progress towards creating the Space Force as well as "a path forward." The defense secretary will additionally be responsible with determining the "appropriate time" for recommending that the president propose legislation advancing the Space Force into a separate military department.